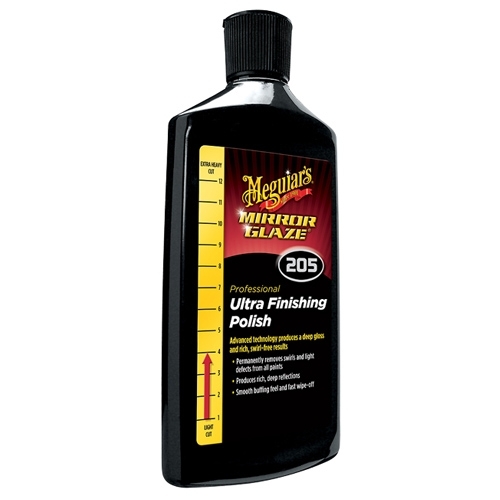 Meguiar's Ultra Finishing Polish #205, M20508 - 8 oz. Uses advanced technology to produce a deep gloss and rich, swirl-free results. This fine car polish uses Meguiar's Super Micro Abrasive Technology. Designed for use after M105 Ultra-Cut Compound and all other Meguiar's Compounds. Not a cover-up. Meguiar's M205 Professional Ultra Finishing Polish permanently removes swirls and light defects from all paints. For use with Rotary Buffer, DA Polisher, Orbital Buffer and by Hand. Meguiar's Ultra Cut Compound #105, M10508 - 8 oz.